It is all about biodiversity- a big word that drives all of our work here at the Habitat Corridor Project. Yes,there are plants from other places in the world that are great for saving water and providing nectar for non-native pollinators; however, co-evolution of California’s flora with its fauna is one of the most compelling reasons for growing California native plants in your garden and supporting their continued presence in our urban environment. Though many commonly used garden plants can supply nectar to bees, butterflies, and other insects- native plants do it just right - the right timing, the right nutritional content, the right floral structure. They have done this for a long, long time and it is important to protect their place in our urban landscapes. 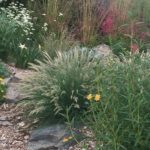 ← SRJC Design Templates and Demonstration Gardens – Breaking Ground!